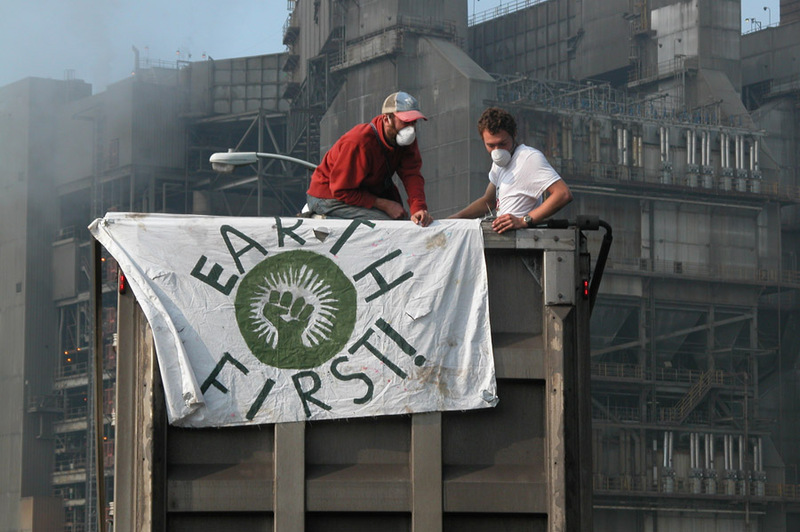 Early this morning, activists with Earth First! and Rising Tide North America set up a non-violent blockade of American Electric Power's (AEP) nearly 50 year old Clinch River coal fired electric facility. Emitting millions of pounds of pollutants yearly, the Clinch River coal plant threatens the health and lives of thousands of downwind residents and the surrounding environment. Burning coal is not only a primary factor behind global climate change, but also drives the expansion of large scale strip mining. Large scale surface mining destroys forests, streams and communities as it alters the Appalachian landscape forever. 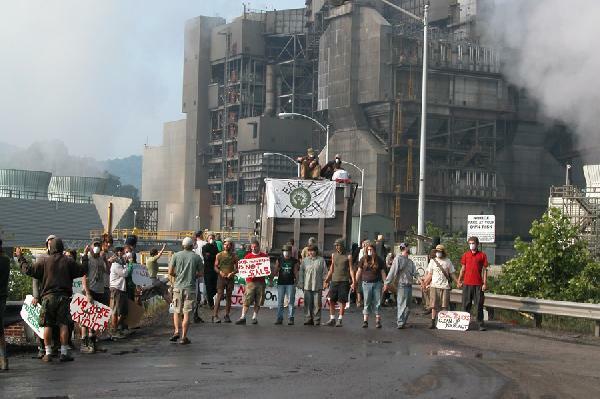 July 10, 2006, Carbo, Virginia - Early this morning, activists with Earth First! and Rising Tide North America set up a non-violent blockade of American Electric Power's (AEP) nearly 50 year old Clinch River coal fired electric facility. Emitting millions of pounds of pollutants yearly, the Clinch River coal plant threatens the health and lives of thousands of downwind residents and the surrounding environment. Burning coal is not only a primary factor behind global climate change, but also drives the expansion of large scale strip mining. Large scale surface mining destroys forests, streams and communities as it alters the Appalachian landscape forever. Over 50 activists arrived at AEP's Clinch River plant at 9:00 this morning. An Earth First!er attached a rope to the bridge and stretched it across the road while another suspended himself below the bridge over the Clinch River. One activist locked himself to the axle of the coal truck. 1. Shut down the Clinch River facility and all aging, dirty coal burning power plants. 2. 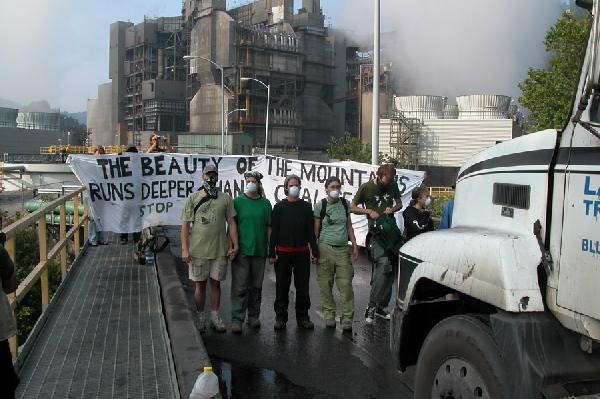 An immediate halt to mountaintop removal and other destructive forms of strip mining. 3. A nationwide response to the reality of global climate change marked by a move away from fossil fuels, transition towards cleaner sources of energy and vigorous promotion of electricity conservation. "The Clinch River facility is a symbol of all that is wrong with King Coal. Dirty air, ravaged landscapes and global climate disruption are the legacies of a corrupt, inefficient and destructive industry that kills with impunity" said Patrick Garnett of Lexington, Kentucky. "The coal industry and its government puppets are ignoring widespread public concern over large scale strip mining, air pollution and global climate change" said Erin Mckelvy of Blacksburg, Virginia. "Concerned citizens are forced to take direct action to call attention to the devastation caused by the irresponsible mining and burning of coal" she added. The Clinch River coal burner releases 4.25 million pounds of carbon dioxide into the air annually, contributing to an unpredictable change in the global climate. Particulate pollution from burning coal has been proven to worsen asthma for residents across the nation. Mountaintop removal coal mining in Appalachia has destroyed over 800 square miles of the most biologically diverse temperate forest in the world. Over 1200 miles of streams have been buried by valley fills and mining waste. "I was born here in southwestern Virginia. The mountains here are part of my soul. They are sacred to me, and also to God" said Ernest Wayne Cantrell of Clintwood, Virginia. "I fight back because I can't continue to watch the world's oldest mountains be leveled forever" he continued. Earth First! is an international environmental action movement focusing on protecting wild nature. Rising Tide North America is part of an international network focusing on the root causes of global climate change.